Bears in town usually cause problems for people. 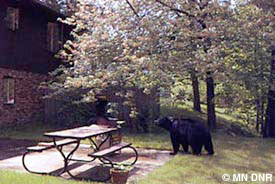 Bears are attracted to homes and cabins by garbage and bird feeders. Pet food, charcoal grills, fruit trees and gardens may also attract bears. Once a bear finds food around your home it will likely return. Never feed bears--They will associate people with food and may become a problem. Bird feeders and bears DON'T MIX. Reduce garbage odors. Rinse food cans and wrappers before disposal. Wash garbage cans regularly and use lime to cut odors. Keep garbage cans in a bear-proof container or in a garage until the morning of pickup. Remove bird feeders in the spring. If you persist in feeding birds during the summer, remove seed, suet, and hummingbird feeders at night. Use an energized fence* to keep bears out of beehives, sweet corn, fruit trees and berry patches. Barking dogs, bright lights and noisemakers will sometimes discourage bears from coming into an area. *An energized fence is powered by a low-impedance, high-voltage energizer which provides a short-duration, high-energy impulse. Bears in trees should be left alone. Don't panic! Don't shoot! Don't approach it! Learn to tolerate bears. Many bears are killed or injured when not causing problems. Most bears fear people and will leave when they see you. If a bear woofs, snaps its jaws, slaps the ground or brush, or bluff charges, you are too close! Go inside and wait for the bear to leave. Make loud noises or throw something to scare it away. Always allow the bear an escape route. Leave it alone! The bear will usually go away when it feels safe. Have people leave the area. Remove your dog from the area.